Flirting, persistence and longingness comes alive in Mani Ratnam's Kaatru Veliyidai, feels Divya Nair. There are love stories and then there's romance, Mani Ratnam style. You may forget the former, but the latter will linger on long after you have experienced it. With Ratnam, the premise doesn't matter, the characters do. And the way they fall in love. No wonder then that his latest attempt at romance in Kaatru Veliyidai comes with high expectations. Varun aka VC (played by Karthi) is an Indian Air Force fighter pilot. He falls in love with Dr Leela Abraham (Aditi Rao Hydari). The premise -- that doesn't matter -- is the Kargil war. What matters are the characters. And, of course, the chemistry between the lovers. And they shine in Ratnam's theory of romance, which he delivers with utmost sincerity. In love, flirting is essential and in most of his films, there is a sequence where the guy proposes a date and the girl refuses -- but the expressions are so poetic and charming that you will want to imitate it in real life. Like, when VC asks Leela out for a date in an aircraft, Leela refuses. But he seems persistent. Next, is persistence. Not always expressed in dialogue. VC rings up Leela when she is on duty and makes her listen to the sound of the aircraft's revved up engine, suggesting that he is waiting for her to come. Leela's excuses are deafened by the engine's noise. When she hangs up, she smiles mischeviously. And you know that persistence pays. It is difficult, no impossible, to not fall in love with such characters, even if they are poles and professions apart. Like war and peace, death and life, light and darkness, one cannot exist without the other. They are two sides of the same coin. What is love if not tested? How can you relate to a protagonist who is too perfect? And so VC is flawed -- he is arrogant, and fails on his girl. And the flaw separates them during the Kargil war. Does their love stand the test of time? Replacing Sai Pallavi with the non-Tamil Aditi Rao Hydari was a brave choice and the girl impresses from frame one. Her eyes twinkle in delight, twitch in anxiety and pale in fear and anger. Each of that is captured brilliantly by the filmmaker. It's a delight to watch Ratnam's heroines on screen -- be it Revathy, Manisha Koirala, Aishwarya Rai or Aditi. His actors are charming too. Unfortunately, Karthi is a misfit here. His expressions, particularly his eyes, betray his feelings and he employs too much effort where it is unnecessary. For the time he spent building that muscular body to look like a fighter pilot, perhaps he should have worked on his expressions instead. Full marks to Ravi Varman for his spectacular cinematography. The snowcapped mountains, the silhouette featuring Karthi and all the song sequences are shot beautifully. The title's expression may have been influenced by Bharathiyar's poem Kaatru veliyidai kannamma. 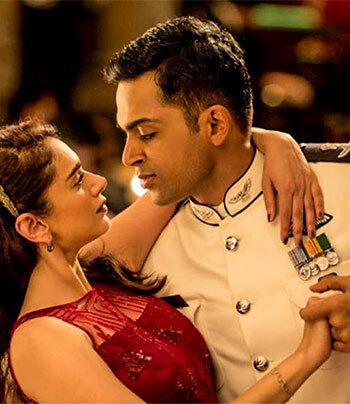 Just like the title could have more than one connotation -- kaatru veliyidai -- through the gap of the wind where VC's aircraft flies or a slip of wind like the svelte hip of love (like in Bharathiyar's poetry), this film could have more than one reason to be admired for. And it's not the plot, for sure. There is also another chemistry that works for this film -- the Ratnam-A R Rahman chemistry of 25 years. The film doesn't let you indulge in the longingness. Or the merit of its characters as much as it should to make you long for them to come together or part ways. And so this breeze (kaatru) lingers for some time, but doesn't last long.